Being successful as a university faculty member requires a high degree of skill in not only the art of education, but also in research, mentorship and leadership. After 27 years of teaching at Wilfrid Laurier University, Eileen Wood still finds immense joy in each of these aspects of her craft. Wood, an associate professor in the Department of Psychology, is an award-winning educator and sought-after researcher who has been formally recognized for her teaching and scholarly work several times over her career. She joined Laurier's Teaching Fellows in 2014 and was named a 3M National Teaching Fellow in 2016. "Teaching is hard work but it is worthy work," says Wood. "You can love and take pride in your teaching as much as your research." 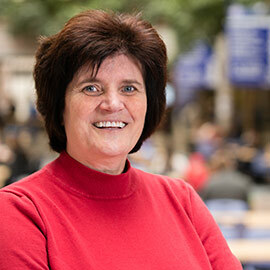 Wood has developed innovative online courses, introduced interactive technology to her curriculum, and devoted her research to the scholarship of teaching and learning. This dedication to investigating how different types of students learn led Wood to question typical classroom interactions. Of particular interest to Wood is the use and impact of technology in the classroom. She notes that while technology distractions are commonplace in the modern classroom setting, in-class distractions are hardly a new phenomenon. Daydreaming, doodling and chatting with peers have always diverted students from the task at hand. While the prevalence of laptops, smart-watches and cell phones may present a different set of challenges, Wood says they also offer students and instructors new opportunities. Wood's research shows that when students attempt to multitask by using technology to interact with things outside of the course content, their engagement and their grades will suffer. To combat this off-task multitasking, Wood suggests implementing useful diversions related to the lesson. "We know that technology is being used inside the classrooms," says Wood. "I was interested in exploring whether these diversions could be harnessed in a meaningful way to enhance students' learning experience." "On-task multitasking, or giving students a task related to the content, keeps them better engaged for the entire class. As an instructor, you can integrate opportunities for students to use their technology to collaborate with peers and explore new resources related to the topic at hand." In Wood's classroom, forays into intentional distractions also result in students collecting new information, sharing it with peers and challenging the concepts being taught. For Wood, giving students the time to ask course-related questions that may veer off-lesson helps prepare them for their academic and professional future. "This is the type of collaboration that occurs in university departments," says Wood. "We rely on the strength and knowledge of those outside of our own discipline and get pulled into new, important lines of questioning." While she is extensively published in her field, Wood's work spans past the edges of psychology to other areas such as social work, health sciences and chemistry. From co-designing collaborative studies with Laurier students focused on academic integrity, to working with faculty colleagues in chemistry and biochemistry to further the research on metacognition, Wood creates an environment of openness on campus. She calls this a "cross-play" approach. "It is important to participate in experiences outside the bounds of our particular field," says Wood. "Eliminating the barriers to access across different departments and engaging students in this process is key." Wood actively encourages undergraduate students outside of her department to join her lab. By inviting students from different areas to teach each other, Wood facilitates an environment where everyone is able to contribute a unique perspective. "This is what I love about Eileen, her lab is treated as an extension of her family," says third-year health sciences student Jonah Cooper. "She provides support when we need it and gives us the chance to return the favour." For Aaron Lewis, a third-year student in the Department of Biology, working with a supervisor outside his own discipline has broadened his horizons. "Working and researching with the Wood lab has provided me with so many opportunities," says Lewis. "Eileen has a special focus on helping students develop and achieve their learning goals by providing the best project experience." This approach to supporting undergraduate research comes naturally to Wood. For her, it is critical that students receive more than just a degree in their determined field during their time at Laurier. "These students are our future in the academic world and beyond," says Wood. "They will support further education, research and development, so it is my job to support them in meaningful ways while they are here."